Music, like any art form, is subjective. It's rare that a sound has universal appeal across multiple genres. In fact, that's the hardest part of music. In today's musical climate, rock and roll is a niche market and most bands can only claim fans in one specific genre. Enter Atlanta, GA’s POYNTE into the fray and you'll be hard pressed to find someone who actually doesn't like the band. Sure there are heavy guitars and syncopated beats, but there's also a lyrical connectivity and a melodic sense that attracts people to their music. 2015 was a year that saw tremendous growth for POYNTE. The band experienced many firsts. They released their first full-length album in ‘Discreet Enemy’. They released their first music video for “Hold On”. They played their first National tour with platinum-selling artist Trapt and Sons of Texas. 2016 is shaping up to be another stellar year as the band has signed on with High Road Publicity to handle their press and radio campaigns. The band is shooting a music video with Director Andrew Burn for their track, “Take Control” and will be on tour with 2015 Ernie Ball Rock On The Range Battle Of The Bands winners, Screaming For Silence and their bearded brothers in Guns Out At Sundown. Vocalist Kenny Hathorne’s voice and vocal melodies have been the key to furthering the band’s songwriting. Surviving a scissor lift accident, where he ended up with a titanium jaw replacement, Kenny leaves no doubt that he is destined for something great! Guitarist Matt Bryant is one of the founding members of the band. Matt is a seasoned musician that has become a recognizable figure in the Atlanta music scene. He has been a driving force behind the group since the beginning. The final elements were the additions of drummer Josh Fulcher, bassist Bryan Poss and lead guitarist Jake O’Donnell. Together, they've created the core that the band has long sought after. While previous POYNTE lineups have had some success, the group senses their best days are yet to come. Some of their accomplishments include winning the 2012 Ernie Ball Battle of the Bands, which earned them a slot on the RockStar Uproar Festival in Atlanta, as well as winning the 2012 Cabo Wabo Your Shot to Rock. 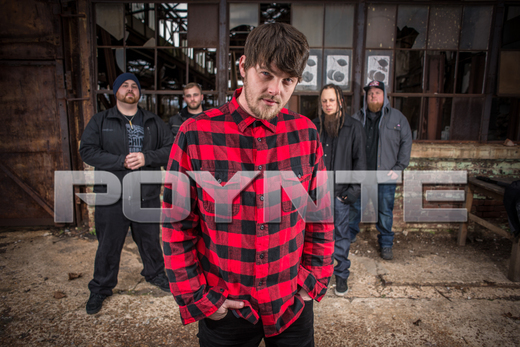 POYNTE has also shared the stage all across the Southeast with national acts such as 10 Years, Nonpoint, Shinedown, Godsmack, Papa Roach, Saliva, Drowning Pool, Fuel, All That Remains, Trapt, Sons Of Texas and Taproot. Written and refined over the course of a year, the band recorded ‘Discreet Enemy’ over a 60-day marathon in the band’s own studio, Covington, GA’s The Audiovault, with additional recording by Mike Froedge (Black Label Society/Double Drive/Bloodsimple) at Open Sky Studio. ‘Discreet Enemy’ was mixed by acclaimed producer/mixer Andy Reilly at Muse Productions (The Cult/Iron Maiden/Bon Jovi/The Police) and mastered by Matt Dalton (Chiodos/Hed Pe/Attila/Tantric/Royal Blood) at 37 Studios.